I am in the middle of my thesis and, full closure, I actually do not intend do reinstall my whole system (I am using Win10) and my thesis requires a lot of other porgramms with even bigger setup issues than TexStudio/Miktex2.9. I got problems a couple of days ago using TexStudio. Different things actually, I lost track of them. 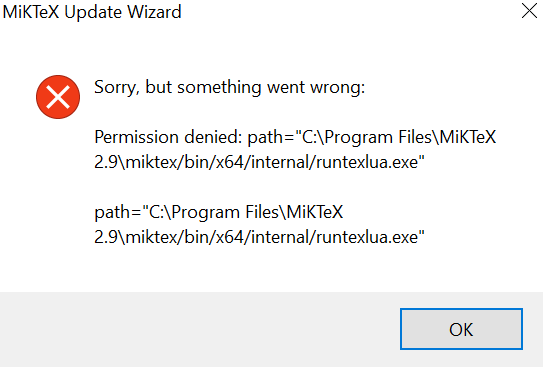 Well, why did you try to reinstall MiKTeX if TeXStudio makes problems? Which problems did you get? You did not descibe exactly what you did to reinstall MiKTeX so we can only guess what could happen. Now download the (I recommend) netinstaller from the MiKTeX homepage to install the complete MiKTeX. Restart the netinstaller to install MiKTeX with the downloaded files on your computer. Run the installed Package Manger to be sure all packages are up to date! Not the answer you're looking for? Browse other questions tagged miktex installing miktex-update or ask your own question.